Lego has a habit of producing quality film tie-in merchandising. Nowhere is this more obvious than with it's Star Wars models. 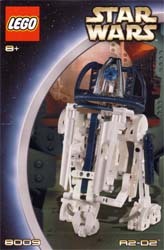 The R2-D2 model is constructed out of pieces from the standard Technic Lego series, with a few extra customised accessories thrown in to stop you making one out of any old Technic kit you may already own. The finished model, in true Technic fashion, doesn't actually look that much like the R2-D2 robot we know and love from the movies. But that is because it is supposed to represent the inner workings of the droid - which it does rather nicely. It looks pretty cool, is easy to assemble and will appeal to old and new Star Wars fans alike. Whether you want something to play with, display, or just something to build... this is a well priced model for all Star Wars fans. The only slight complaint I had was that it was a little too easy to complete. I was hoping to spend a good afternoon putting this together, but you'll have finished it within an hour.